Some days, you’re on top of the world. And some days, you think the world might to end. 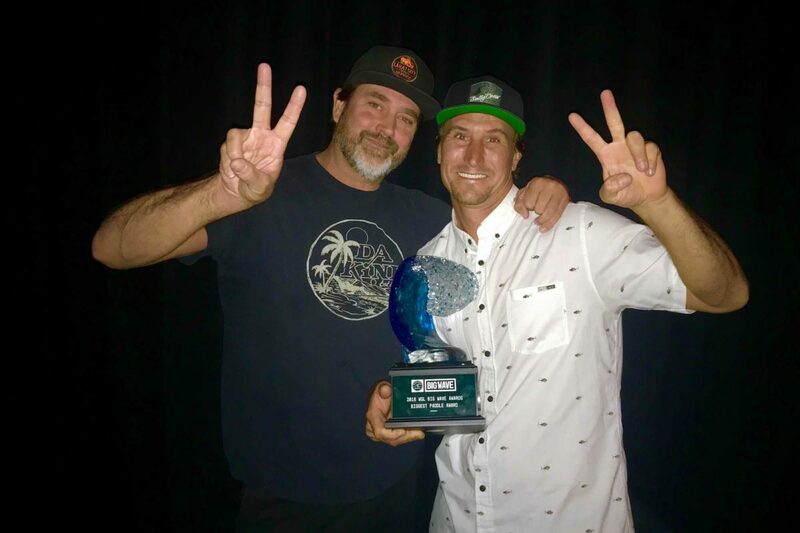 Those two days came in quick succession this winter for Hermosa Beach photographer Brent Broza, who collected his second WSL Big Wave Paddle Award on April 29 for a shot taken earlier this year of surfer Aaron Gold on a wave later judged to be 55-feet high. 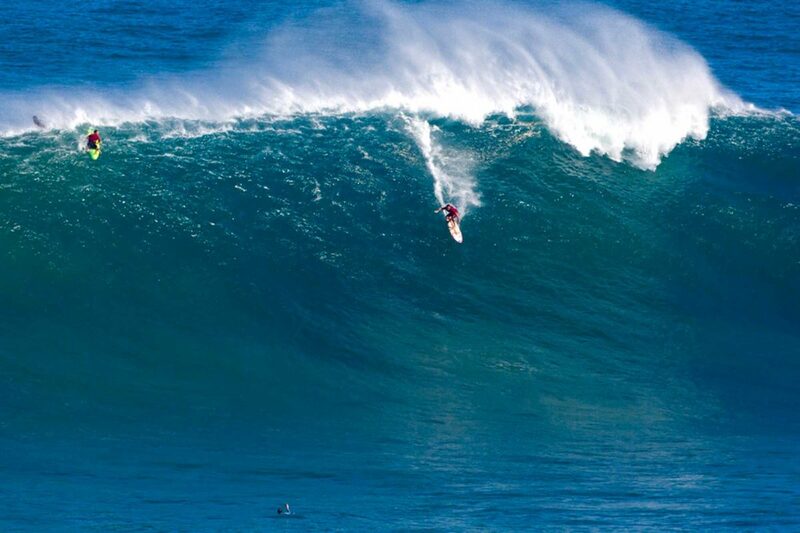 He captured the winning photo at Jaws, a big wave spot on Maui, the day after a false-alarm emergency alert temporarily paralyzed Hawaii with fear of nuclear annihilation. Broza, a South Bay native and one of the areas most respected photographers, typically takes a month off in the beginning of the year and heads for Maui, where he used to live. In the fabled El Niño winter of 2015-16, Broza captured a shot of Gold at Jaws on what was called the largest wave ever paddled into, and went on to win the WSL award. He had all of his gear ready to capture more Pacific power. But on the morning of Jan. 13, Broza and most of the other people in the Hawaiian islands received a text message that foretold imminent disaster. “EMERGENCY ALERT: BALLISTIC MISSILE THREAT INBOUND TO HAWAII. SEEK IMMEDIATE SHELTER. THIS IS NOT A DRILL,” the alert read. “I was eating breakfast at a friend’s house when it came. We were waiting for a while, because Jaws was supposed to be good. We were trying to get official clearance. But there were no follow-up alerts, nothing on the news, nothing on the Internet. We didn’t know if it was a hoax something weird,” Broza recalled. Broza and Aaron Gold celebrate April 29 at Red Bull headquarters in Santa Monica, where the WSL Big Wave Awards were held. For about 45 minutes, thousands of people on the islands thought the world was going to end. According to news reports about the incident, Vern Miyagi, the administrator of the Hawaii Emergency Management Agency at the time of the warning, subsequently acknowledged that the message had originated with an employee error. Miyagi declined to identify the employee, and later resigned. The ocean, however, was not inclined to wait out the emergency. A powerful swell was on the rise that day, and some surfers, including Gold, begin taking in waves that afternoon. Broza rose about 2:30 a.m. the next morning to drive from where he was staying in Napili on the west side of the island to to Jaws. He left early, as he always does when shooting Jaws, to get one of the limited number of prime cliff-side positions for shooting the wave. The only access to the cliff comes from a narrow, one-lane dirt road that quickly becomes jammed when the surf is big. Combined with the unpredictability of Jaws, which is open to huge amounts of swell but is also infamous for strong winds that can render it tough to surf, it makes for a challenging shooting experience. “You just don’t know what the situation is like until you get there. Many times, the swell is not supposed to hit till 2 p.m., but you’ve gotta be there early. It’s a full commitment. It can be 14- to 16-hour days,” Broza said. The lineup at Jaws is far enough away that it can be difficult to tell who is taking off when he begins to shoot, Broza said. He hadn’t spoken with Gold that day, but it soon became clear that he had captured magic. A few days after the session, Gold posted Broza’s photo to his Instagram, and revealed that the wave had come on his grandmother’s birthday. “Pic by none other than @brozaphoto, the same photographer who captured the winning image of my record wave in 2016,” Gold wrote. It was an odd coincidence that the two should should be paired again. After the nominations came out, Broza was proud of his shot, but was not confident about his chances. With two major award wins under his belt, Broza is thinking about new ways and places to shoot. He’s planning on travelling to Europe next winter to capture Nazare. “I was supposed to go the last two years in a row, but I had to cancel because of a scheduling conflicts. Nazare has a very short window: depending on the swell, you have maybe two days to pack up and go. This year, I’m putting it on the books to go, make it more of a priority,” Broza said.